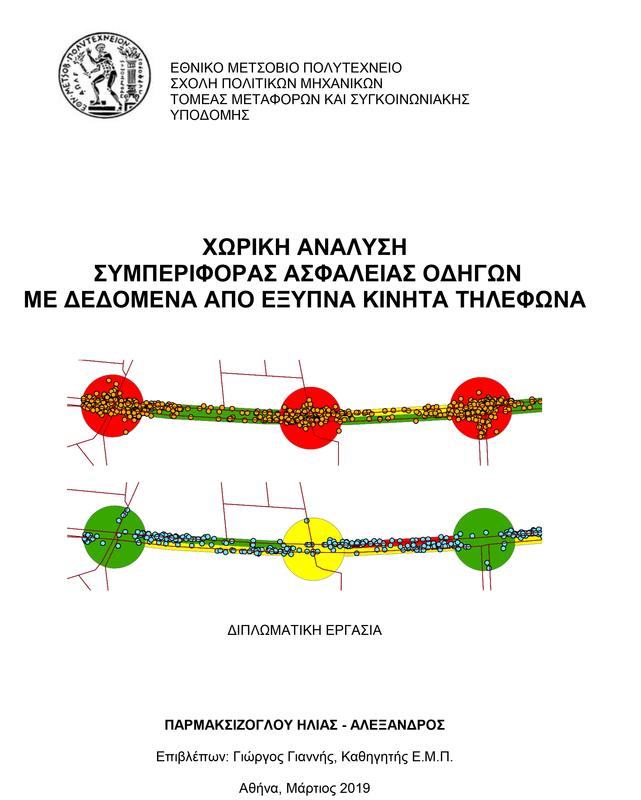 Ilias Parmaksizoglou, “Spatial analysis of driver safety behavior using data from smartphones”, Diploma Thesis, NTUA, School of Civil Engineering, Athens, March 2019. The aim of this diploma thesis is to conduct a spatial analysis of driver safety behavior using data from smartphones. Specifically, this research investigates how harsh accelerations and decelerations per day, which are key elements of everyday driving, interact with both the road environment and road users’ behaviour. Data were processed in a GIS computer environment, resulting to the creation of new tables describing the phenomena observed on the road map of the study (Leoforos Mesogeion) in node and link areas. Additionally, analytic maps were developed that aimed to indicate patterns of the accumulation and ranking of the harsh events in the selected road axis. Finally, four linear regression models were developed, which demonstrated speed as the most statistically significant factor in predicting harsh events per day on a region basis.